Plans After High School: Attend Bakersfield College and eventually transfer to Fresno State University and obtain his Bachelor of Arts Degree in Criminal Justice. Eventually, wants to become a crime scene investigator. What Makes Dwayne #BulldogSTRONG: After his freshman year at Golden Valley High School, Dwayne Dickerson moved out of Bakersfield and attended a different high school in a different city for his sophomore year. Being gone for that year, Dickerson realized how much he missed his friends, the community, and being a Bulldog. Halfway through his junior year, Dickerson moved back to Bakersfield and reinserted himself at Golden Valley High School with a renewed since of PRIDE of being a Bulldog. "I grew up in the community and went to Horizon and McKee," states Dickerson, "The Golden Valley community and my friends that live here mean a lot to me." As a senior, Dickerson has heavily involved himself with the culture of Golden Valley High School. As linebacker for the football team, Dickerson was the ultimate team player as he was the model of consistency, stability, and optimism in the midst of a season that was met with some challenges. This season, football players were given helmet sticker decals (G,P,S) for demonstrating GROWTH, PRIDE, and SERVICE and in an iconic picture taken in a game against Indpendence, Dwayne is featured with decals plastered all over his helmet as proof that he was #BulldogSTRONG throughout the season. As one of the captains of the football team, Dwayne was among the team leader in tackles and was a consistent presence around the football. For his efforts, Dickerson was selected to the US Army All Star Arena Bowl as the lone representative from Golden Valley High School. In the spring, Dickerson has been a valued member of the baseball team that brings a level of athleticism and energy that is infectious for his teammates. Dickerson is consistently hustling and encouraging his teammates along the way. Beyond his success in athletics, Dickerson is also an active member of Golden Valley's Project BEST a program designed to help African American males focus on a college going mindset. Dickerson currently maintains a GPA above a 3.1 and has aspirations to eventually be a crime scene investigator. "I am pretty inquisitive," states a quiet Dickerson, "I like to problem solve and find solutions to issues and I think being a CSI will allow me to focus on my skills." 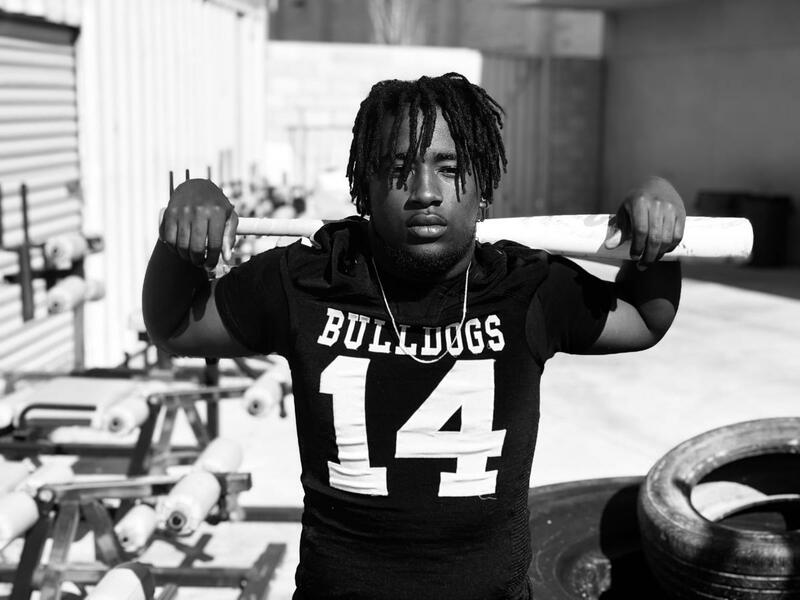 For his efforts as a leader on the football field, baseball diamond, and on the campus of Golden Valley High School, Dwayne Dickerson is #BulldogSTRONG. One of Dwayne Dickerson's best football games was against Independence High School. What #BulldogSTRONG Means to Dwayne: "Being #BulldogSTRONG means that we have to be one as a community. Part of being one involves us willing to help out anyone that may be in need. It also means that we always give 100% in all that we do and that we are loyal to each other as Bulldogs."